Sen. Susan Collins, R-Maine, is surrounded by reporters as she heads to go vote on Capitol Hill in Washington, Tuesday, Nov. 7, 2017. AUGUSTA, Maine — Republicans in the U.S. Senate have altered their tax reform plan to include a repeal of the Affordable Care Act’s mandate that all Americans have health coverage or face a penalty. U.S. Sen. Susan Collins doesn’t like that. The Maine Republican isn’t saying that’ll make her vote against tax reform (yet), but it makes the path toward “yes” harder. The moderate Collins already has helped kill two of her party’s efforts to repeal the health care law this year. But she has been open-minded on tax reform, joining with Ivanka Trump, President Donald Trump’s daughter and adviser, for a Biddeford forum last week on the subject. On Wednesday, Collins told MSNBC that she didn’t think linking tax reform with the so-called individual mandate is “a good idea from either the political or policy perspective,” though she supports lower taxes and hasn’t made a decision on the ever-changing Senate tax proposal. Sen. Ron Johnson of Wisconsin became the first Republican to oppose the Senate tax plan Thursday. Three Republican no votes could kill it, making Collins’ vote potentially crucial. Getting rid of the individual mandate would unravel the already beleaguered health care law. The individual mandate has been the most unpopular part of the Affordable Care Act. In 2016, the IRS said the average penalty paid was $470. But it’s also one of the law’s linchpins. Without it, people who are mostly healthy wouldn’t buy insurance and costs would be higher for everyone else. The Congressional Budget Office has said scrapping it would cause 13 million more people to be uninsured by 2027 and that average individual premiums would rise by 10 percent relative to baseline projections. Why? Healthier people would be less likely to buy insurance, leading to higher premiums and that rise would keep others from buying plans. 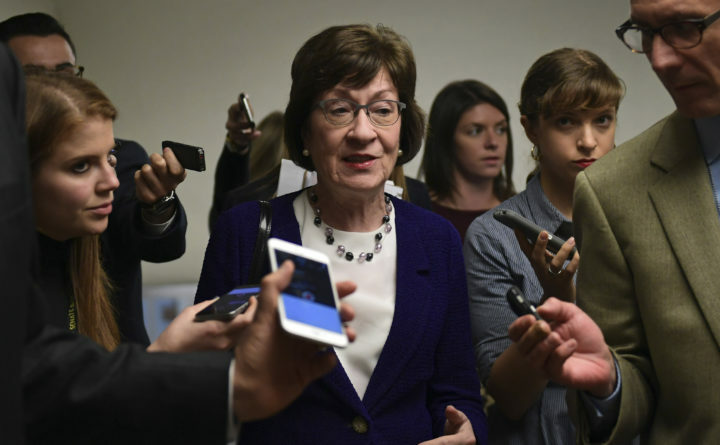 But that narrow concern isn’t the only reason that Collins is skeptical of the plan. Collins told MSNBC that the impact on premiums from scrapping the mandate would outweigh the current penalties. She said it also endangers a bipartisan Affordable Care Act stabilization bill that she supports. However, she also opposes a Senate plan provision that would scrap a state and local tax deduction and an item in the House tax reform bill that would eliminate a deduction for medical expenses. The House voted for its version of the Republican tax change plan 227-205 on Thursday. U.S. Rep. Bruce Poliquin, a Republican from Maine’s 2nd District, voted for it. U.S. Rep. Chellie Pingree, a Democrat from Maine’s 1st District, opposed the plan. Collins called tax reform “a moving target,” but it’s clear that Republicans have work to do to get her vote. For a roundup of today’s Maine political news, click here for Daily Brief. Click here to get Maine’s only newsletter on state politics via email on weekday mornings. Correction: An earlier version of this item said the Senate plan would keep the state and local tax deduction. It would end it.